Laveen is an urban village located inside of Phoenix in Maricopa County, Arizona. It has a population of 48,021 residents and rests on 48 square miles of land. 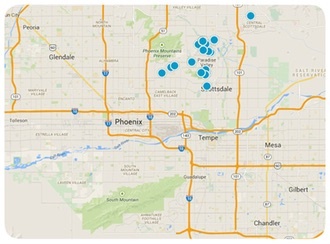 Laveen is situated only eight miles of Downtown Phoenix, between South Mountain and the Gila and Salt Rivers. Some parts of the village are in an unincorporated community in Maricopa County, while the other part falls within the city limits of Phoenix. Laveen’s past was home to cotton, dairy farms, and pastoral alfalfa fields. However, now the village has been urbanized by residential areas and commercial developments. There are plenty of things to do in the village, shopping, dining, entertainment, and outdoor recreation are all amenities of living in the village. There are many beautiful homes for residents to choose from. You will find single family homes, large estates, townhomes, condominiums, and apartments. The median home value is $169,200. The home value rate has risen by 2.4% in the last year and it’s predicted to rise by another 3.9% in the coming year. The median price per square foot is $84. If you are interested in purchasing a home in Laveen, contact us today for more information.